Established in the year 2013, Alpha is a pharmacy retail chain with a young and youthful approach in business with an experienced team onboard. The pharmacies are located in key areas of Dubai in exclusive residential and commercial spaces. Ranked as one of the most professional and friendly Pharmacies in the region. binSina is the only Pharmacy to win the Dubai Service Excellence Scheme. Experience binSina services in over 70 branches across the UAE. Dima Laundry are proud to be one of the most well-known and established dry cleaning companies in Dubai - a reputation they have come to enjoy because of their 100% guarantee, customer service and experience with a wide range of fabrics and garments. Mastihashop is an international Franchise from Greece with outlets in Greece, New York, Jeddah, Cyprus, China, Dubai. & Paris. The first and only Mastihashop branch in the UAE is opened in aswaaq Al Bada'a. SRG Nurseries is a division of Spring Rose Group Dubai, having services including landscaping, real estate, nurseries and technical services. SRG has live plants, tree saplings, decoration plants, cactus, indoor plants and outdoor plants. Dubai's most dynamic tyre solution provider. Delivers a complete 360-degree solution for all tyre related needs including replacing old tyres with new ones from leading brands, performance enhancing wheel alignments, tyre rotation and nitogen fill. Kiddy Couture is a boutique hair salon for kids and teenagers; From Funky Cuts to Cut & Run's, one of the Dubai's coolest Kids hair salon with clean, stylish & friendly atmosphere. Fun-packed salon with a kiddy ride for the little ones. 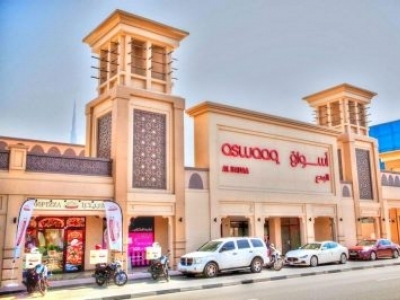 aswaaq is a brand recognized as one of the trusted retailers in UAE. In Compliance with the international standards, aswaaq manages and operates supermarkets and retail community malls located at the heart of residential communities.